So, it’s very refreshing to see when Chief Information Officers are willing to share their viewpoint on BYOD in their Hospital. One who did share some pointers recently was Jersey City Medical Center CIO Stephen Li. In terms of BYOD on a Hospital Wireless Network, a recent survey indicated that 68% of Healthcare providers utilize an iPhone at a professional level. Well, the other 32% with their Android (or other) device can’t simply be ignored. 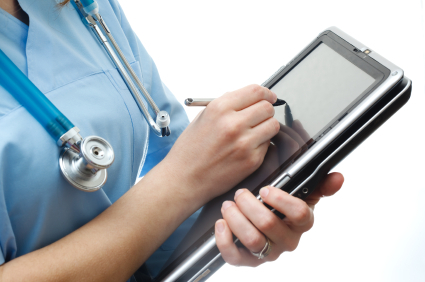 So, here are 10 Tips for Hospital BYOD Implementation. 1. Like television was to radio, BYOD change is inevitable. Put your arms around BYOD, it continues to grow in many environments. Hospitals just can pay particular attention to any breaches that have occurred in other locations so they don’t happen in your facility. Learn from someone else’s mistakes, don’t make them your own. 2. Review all applications that will be permitted for use on the hospital wireless network. Who is going to dictate which applications will be allowed? Which applications are “must-have” and which can be left off of the network. Doctors do their research, so should those providing them connectivity for BYOD devices. 3. Review all web applications to verify any security challenges. 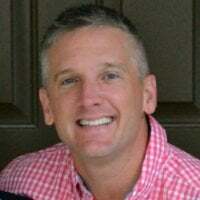 Especially those that handle and store sensitive data like Customer Relationship Management platforms, all email as well as any web portals that could expose your organization to additional risks. Apps need updating too! 4. Review all devices that will be authorized to access the wireless network. “Cindy, you didn’t really bring that jail-broken device onto the network...did you?” That’s not a conversation you want to have after a security breach. 5. BYOD Policy must leave no room for error. Ever hear the saying that, “When it’s in writing, it’s a Plan” Now, I’m sure there’s some thoughtful attorneys out there that might believe the written word leaves room for interpretation. However, when a policy or plan is clear and concise, it is hard for someone to say they didn’t understand. 6. Look at wireless access solutions capable of integrating with Active Directory or another means of identifying users on BYOD devices. Role-based access control gives your IT Department the ability to segment users into different groups, allowing (or denying) their access to critical data. 7. 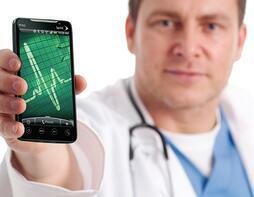 Give all hospital staff the proper training and have them sign off on the BYOD Policy. The BYOD policy and procedures you spent all that time discussing, voting on, writing and implementing means nothing if the hospital staff doesn’t literally sign off on the paper. 8. Require that all devices and/or applications may be subject to audit on a regular basis. (Think major professional sports and random drug screenings). 9. Make sure any mobile device management software actually manages mobile devices. If your organization is looking into mobile device management software, make sure the solution you choose “allows” all the applications you have selected to be a part of your regular workflow. Working closely with your vendor by providing a list of mission-critical applications that must run in conjunction with the MDM software helps to avoid any conflicts. Remote wipe capabilities, network-wide application distribution and other features like elimination of camera and video functions are areas of particular interest. Make sure the solution does what it says it can do. 10. Select a flexible wireless access solution. As hospitals across the country develop BYOD policies, it’s obviously important to make sure your current infrastructure is capable of handling all the new features that are available. Bottom line is if you’re going to invest in advanced software solutions that allow for safe BYOD, you certainly need to take a look at the infrastructure that will allow those wireless devices to operate your new mission-critical applications. Technology changes quickly, you may have heard of the new 802.11ac wireless solutions from companies like Aruba Networks. Well, take a look at the number of clients on the market that currently utilize “ac”. There aren’t many...yet, but more are being manufactured so if your wireless solution currently supports up to 802.11n, we’re estimating another 3 years of wireless network happiness. These are 10 Tips for Hospital BYOD Implementation and obviously, more can be added to the list. The more informed you are about the reward with BYOD in a hospital environment, the better prepared you’ll be to mitigate the risk that is often associated with such an implementation. 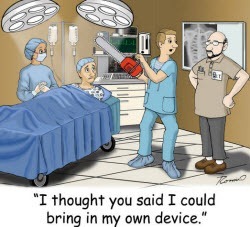 If your healthcare facility is considering a BYOD solution for your hospital we are here to help. The team here at SecurEdge has worked with many hospitals to prepare their wireless networks for BYOD implementation. You may contact us here with any questions or for a free consultation. We are glad to help!